Thank you Tiem! This complete (with selvage!) 2003 'Art and Culture' issue advertises an international conference on the same theme. 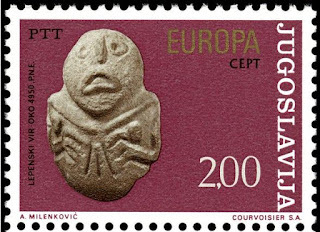 The sandstone figures were found at the Mesolithic site of Lepenski Vir, and were made of river cobbles. What was happening at the site in 2003, to get it on this stamp/in the conference? Another statue from Lepenski Vir. First excavated professionally in 1965, due to dam construction, it is a very unique site. Situated on the Danube river valley, the settlement appears to be the first in construction of an organized town plan, with each house spaced evenly and forming a fan shape from the river. The inhabitants subsisted primarily on fish, thus, many of these sculptures are described as 'fish-like', although many are more stylized than this one. These life-size sculptures were found in every home in a depression next to the hearth. The site is now underwater from the dam. Maxicard with the above stamp.